Grilled Charentaise melon and la joliesse(beauty). The Charentaise melon is coming in, sweet and bright. Treat yourself to one half, cut up, drizzled with maybe some caramel syrup and sprinkle with lavender, put on the grill, your loving husband so tenderly lit up for your plump fruit and once again…as always here on Myfrenchkitchen….indulge with a spoon and shameless delight! VF: Le melon Charentaise arrive sur les marchés, radieux et douce. 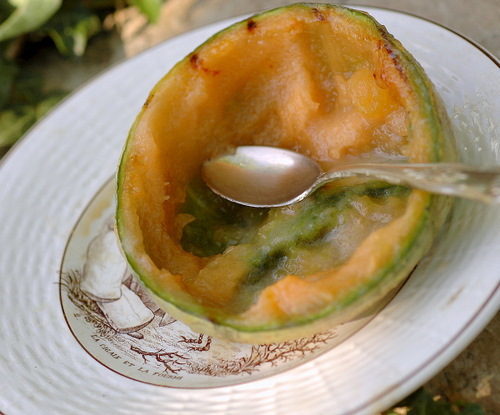 Pourquoi pas se régaler avec peut-être un sirop de caramel, quelque fleurs de lavande et puis on demande à notre amour d’allumer un feu et de griller ce petit melon coupé en deux tendrement, jusqu’a ce qu’il se caramelise. Et comme toujours ici à Myfrenchkitchen, on se régale scandaleusement! 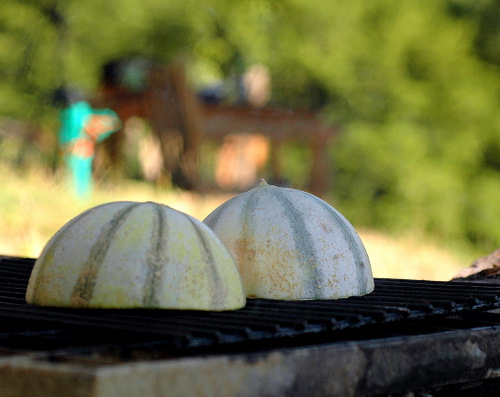 Cut a melon in half, scoop out the seeds and turn upside down on the grill. Grill over medium coals until nicely caramelized. Turn over and pour in some sauce of your choice…I used maple syrup. 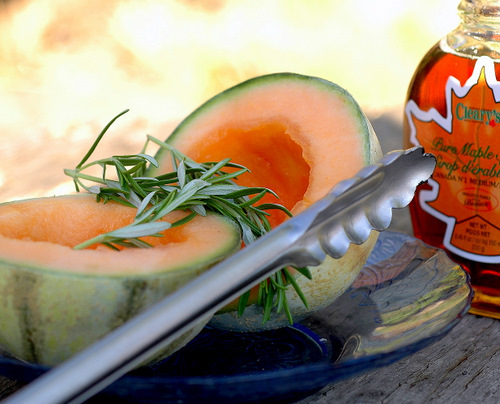 Leave over warm colas for a while to get soft and have the syrup infuse the melon. Add the chopped rosemary and leave another few minutes. Remove to pretty plates, serve with a dollop of cream or ice cream and enjoy warm. I used maple syrup…sue also honey, or a proper caramel sauce. It can also be grilled in the oven, or inside grill. Serve with ice cream, corresponding with your flavour… a vanilla ice cream with caramel sauce, or lavender ice cream with lavender petals, or mint ice cream with chopped fresh mint. For a less sweeter version, use cream or crème frâiche. I have someone dear in my life who is experiencing terrible pain at the moment. 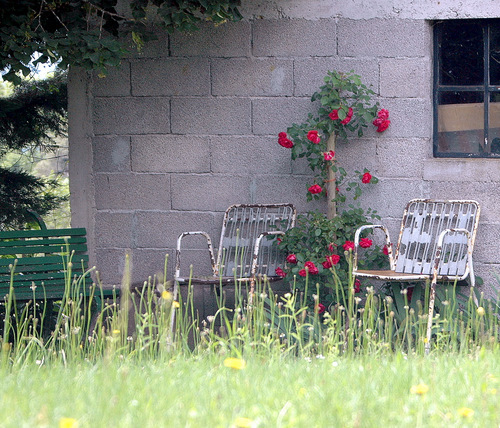 When the rain passed this morning and the world glittered under the Correze sun, I thought of her and her courageous words: “I want to appreciate everything even more than before“, which is hardly possible, since she already appreciates life with every fiber of her being. 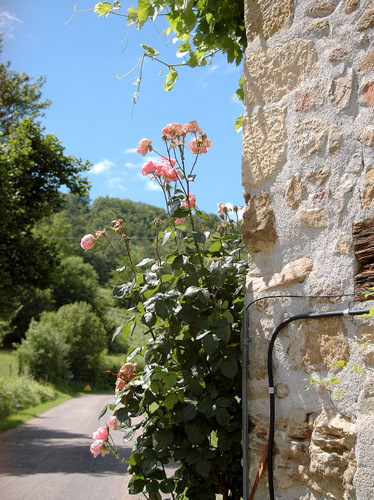 But her words stick to me as I drive along the road here in Puy d’Arnac, forcing me to look at every nook and appreciate the obvious beauty all around. J’ai une chère ami qui endure beaucoup de douleur en ce moment. Ce matin, j’ai parcouru la route de Puy d’arnac avec les mots courageux de mon ami resonnants dans ma tête: “Je désire apprecier toutes les choses plus qu’avant”.. Je peux témoigner qu’elle le fait déja. Mais cette phrase m’interpelle toujours. Elle me force à regarder et observer chaque petit coin et apprécier la beauté abondante qui m’entoure. May her pain and the pain of all those who experience whatever hurt at this moment, subside, so the beauty can become alive again. And may we, who have less pain, appreciate everything even more than before. Je veux bien que tout sa douleur et même les douleurs des autres, peu importe la douleur, s’efface, pour que la beauté vive encore. En plus, il faut que nous, qui sommes épargnés de la souffrance, tentions aussi d’apprécier toutes les choses plus qu’avant. 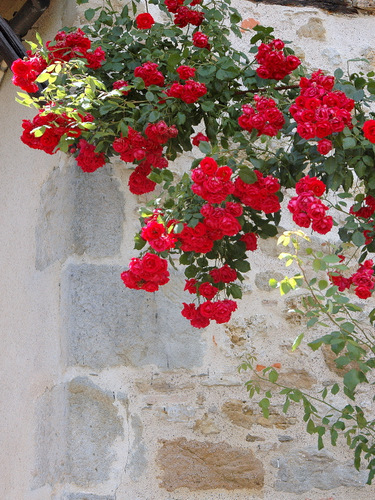 Now is the time for exuberant roses and Puy d’Arnac isn’t shy to show off her splendor. 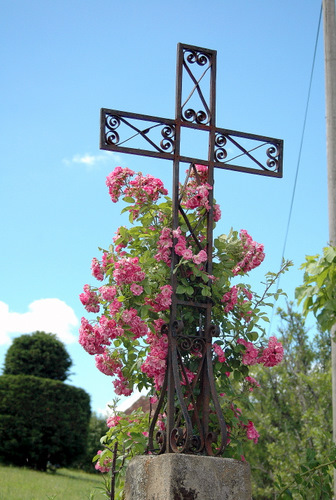 All the way down the hill, the roses drape themselves around the crosses which can be found on every corner of a crossroad, against old walls and staircases, in doorways…where there is a nook , there is a rose. 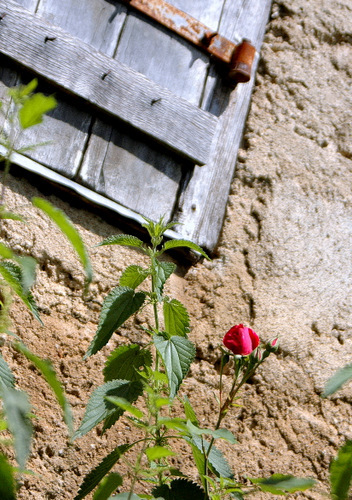 And where there is a rose there is beauty. 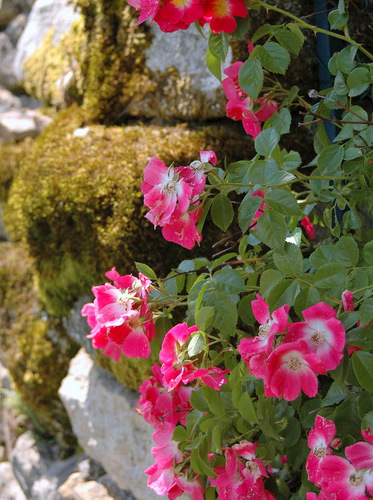 Have a lovely weekend and remember to appreciate the obvious beauty around us and look in closer to find the less obvious. 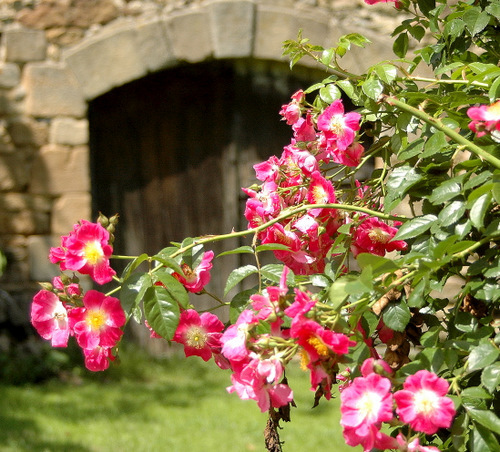 Previous Article Pan sauteed summer fruit and the charming character of Beaulieu-sur-Dordogne. Next Article A summer apricot soup amuse bouche and une fête d’été! Wow Ronell dit lyk lekker! Is dit soos n spanspek? Ek proe dit sommer in my mond…..met die maple stroop en room! 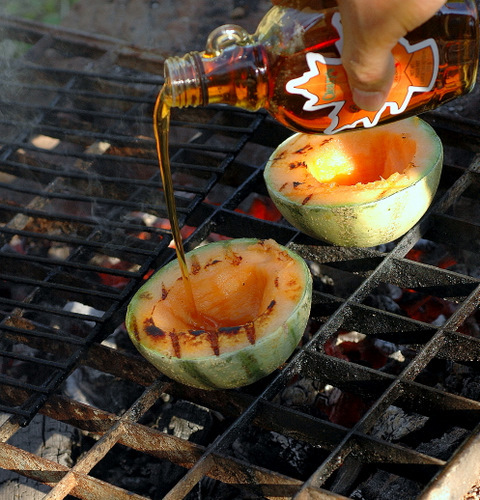 Ronell…Excellent idea for the melon…looks delicious. The philosophy of your friend is a good one…savor every moment. I wish her the very best. I agree with Lori, Ronell. A delicious recipe to try . And the best for you friend. Her approach to life is inspiring. May your friend find some peace and joy in all that comes her way, I wish her well. Ronelle, the melon looks delish, the roses lovely. G’n wonder die skilkommetjie van die spanspek is dolleeg nie!! lyk heerlik! 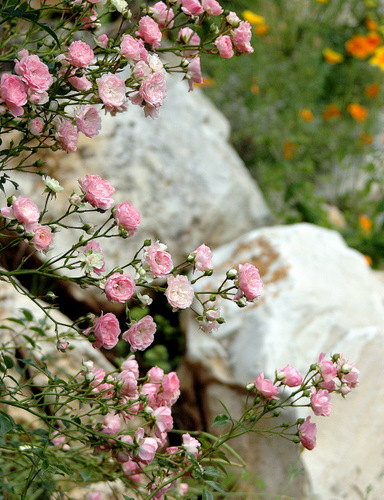 hoop jou vriendin se pyn versag….die rose is sooooo mooi! Thank you, thank you. I need to tune into your lyrical words and your lovely photos. I have never encountered that particular melon, but I’ve never met a melon I didn’t love. All joys to you from the road. P.S. OF COURSE I’ll vote for you for Oprah. I’ll have Jeff vote too. We need the real thing and that would be YOU. I haven’t been able to get on to click. I’ll keep trying. Oh OOPS, I thought it was for YOU! Now I’m tuned in to it and must get to know her. toujours de délicieuses recettes et idées sur ton blog, et aujourd’hui deux surprises, melon au bbq, et très beau texte en français (et anglais mais cela je le savais déjà). Un plaisir a lire, regarder et savourer bientôt. Wow that is completely new idea for me. I am gonna give it a try. I love melons but never even thought of grilling it. 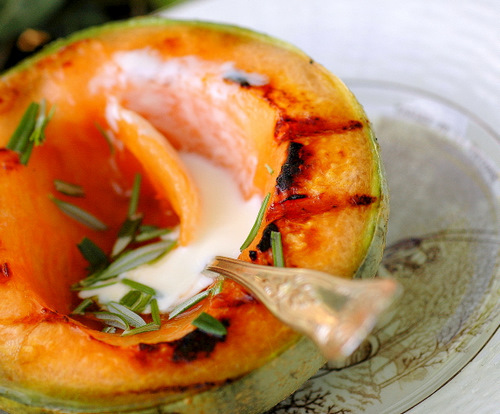 Beautiful words to accompany a very original recipe – I certainly never thought of grilling a melon. Thanks for the visit everybody! Quel beau compliment Benedicte..merci beaucoup! Ingrid ans Stella..yes it is a kind of canteloupe…a small, very sweet, very orange flesh. Delicious. But any melon can work, given that it is firm, but sweet. That melon looks wonderful, as your food always does…. I really appreciated your lovely words about your friend and life, I suffer with health problems, and I always tell those who are healthy, I guess as healthy as you can be with our imperfect bodies, but I tell them to not take it for granted, enjoy life because like me, that can be taken away. Although thanks to minerals, and vitamins, I have felt better and am really enjoy those “good” days and I take full advantage of those. But thanks for your sweet comments. As always, I love your photography, I feel I’m there when I see your gorgeous pictures. Je dois absolument essayer le melon sous cette forme … Je suis sûre que je vais adorer ! 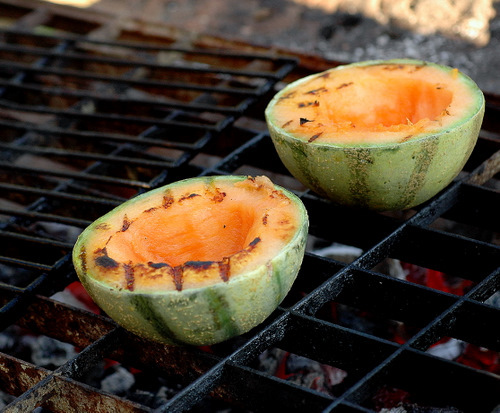 The melon draws me iin – so juicy and coated with a thin syrup – and grilled! Oh my! It must ooze out the juices. 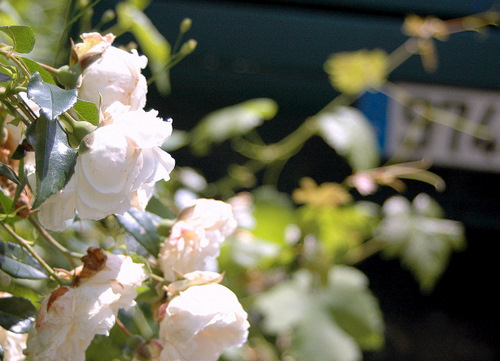 The roses are the perfect reminder to stop and savor – all. Your friend sounds remarkable and I wish healing and sweet thoughts for her. What a delightful recipe Ronell! I have to try that, and I learned the French word for cantaloupe! Thanks! Sending best wishes to your friend. 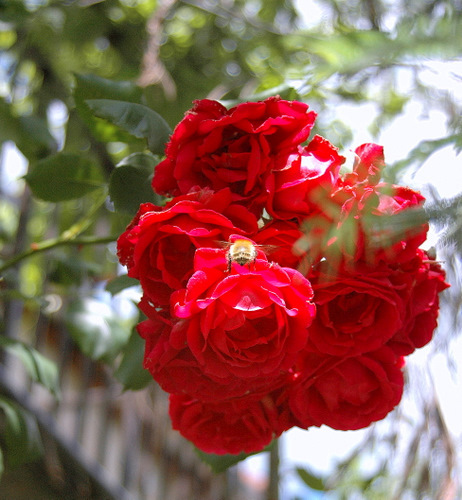 Love the roses, as always! You are very inspiring! It refreshing to see an artist of beauty. Breathtaking this whole site ou managed to put together. Please contact me via email. Magical! You don’t know how wonderful and inspirational your post is!